Have the convenience of leaving your beloved GG's in the safety of their home in familiar surroundings. I can tend to: Daily Visits - general well being check, hard feed/supplements, cover change, feeding out hay. 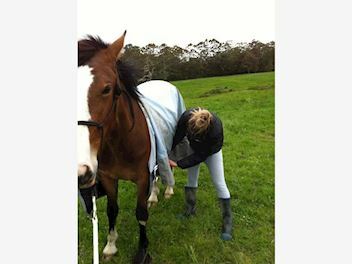 Coat n Care - I can bring in, covers off, mud removal, mane and tail, general brushing as well as any basic medical treatment applications e.g. cream applications, bandaging, abscess soaking etc. I have attended a number of First Aid Equine seminars over the years. I will come to you for a free, no obligation meet to discuss your individual requirements. Prices start from $30 for a Daily visit, plus $20 extra for Coat n Care, however are not fixed and may be subject to change depending on your individual needs, time allocated for number of horses tended to, and location. Available over New Years 2017/2018 and holiday period, servicing the Rodney - Dairy Flat, Albany, Coatesville, Silverdale, Wainui, Redvale area. I have over 15 years of equine experience, having owned 8 horses over the years, and have broken in my own horses and producing them through to competition level. I am very trustworthy, being a contributing member of North Shore Riding Club for four years, and have looked after and tended to a number of horses while owners have been overseas travelling or on holiday - both short and long visits. Please get in touch via text or call on 021 659 384.